On March 4, 2004, Honourable Steve Ashton introduced Bill 22 The Water Protection Act to the Manitoba Legislature where the Bill had First Reading. The purpose of the legislation will be to provide improved protection for Manitoba's water resources and aquatic ecosystems. to allow for declaration of a serious water shortage, and for the taking of action to address such shortages. Second Reading of Bill 22 took place on June 2, 2004, and members of the Legislative Assembly voted to accept the principle of the Bill. Bill 22 is now in the Committee Review stage. Presentations by members of the public to the legislative committee for review of Bill 22 took place September 13, 2004. A wide range of common concerns were expressed during citizen presentations to the legislative review committee. Clarity of definitions, intent, and coordination with exiting legislation concerning water were issues consistently raised in public submissions. 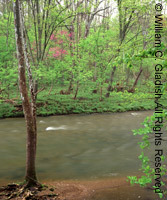 The lack of funding, sufficient staff, and capacity for watershed planning, enabled by the Bill concerned several presenters. View Glen Koroluk's presentation, provided as a private citizen. On November 23, 2004 the Social and Economic Development Committee (the committee charged with reviewing Bill 22) filed its report. No amendments were made at this point. As of April 2005, several amendments have been proposed for Bill 22 at the report stage. The opposition parties have proposed numerous amendments, one of which was adopted by the government. Amendments to Bill 22 continued to be debated, and either passed or rejected in the Manitoba Legislature throughout April and May and into June 2005. April 20; May 5; May 12; May 18; May 25; June 8; June 9; June 13; and June 16, 2005. Bill 22 received Royal Assent at the close of the Third Session of the 37th Legislature on June 18, 2005.
identify ways in which the plan can be implemented, monitored and evaluated, recognizing the need to implement the plan with the assistance of individuals, groups, and organizations. On July 20, 2005 Water Stewardship Minister Steve Ashton released a consultation document, Regulation Under the Manitoba Water Protection Act - Consultation Document for Initial Review Respecting Water Quality Management Zones for Nutrients ("WQMZ Consultation Document"). The announcement for the WQMZ Consultation Document included a public comment period, deadline November 30, 2005. The Regulation of Water Quality Management Zones for Nutrients will be the first of several intended regulations under the new Water Protection Act. The WQMZ consultation document proposes four different Zones that would be applied to lands in southern Manitoba that provide varying restrictions on the application of nitrogen and phosphorus. Manitoba Wildlands provided comments on the WQMZ Consultation Document. Concerns raised include legislative compliance, and the lack of ecological basis for the categorization of lands into the four water quality management zones for nutrients. Manitoba Wildlands also commented on the inadequacy of buffer setback distances from water, the unacceptability of special exceptions for irrigated potatoes, and issues related to maps and data. Manitoba's Water Protection Act was proclaimed on New Year's Day 2006, bringing the legislation into effect. No regulation language is available as of late January 2006. 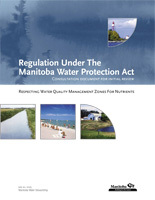 Manitoba Water Stewardship released a document February 2006 entitled Issues and Options Arising from Initial Consultations on Water Quality Management Zones for Nutrients (the 'Issues and Options Document'). The Issues and Options Document responds to the more than 200 unique comments provided by citizens and groups in response to the consultation document, Regulation Under the Manitoba Water Protection Act - Consultation Document for Initial Review Respecting Water Quality Management Zones for Nutrients ("WQMZ Consultation Document"). Many submissions and suggestions were received during the initial consultation phase. Copies of written comments are available in public registry file #5154.00 and on Manitoba Water Stewardship's website. How the regulation would apply particularly to existing developments and operations and when it would come into effect. How the maps would be referenced in the regulation especially those prepared based upon the less accurate reconnaissance-level surveys and whether maps should be embedded directly into the proposed regulation. Perceptions that this initiative to reduce nutrients to Manitoba's water systems is being targeted at the agricultural sector. A variety of other technical areas including the need to better reflect groundwater protection, the size of buffer widths, plus others. Although falling under a different regulation, concerns were expressed regarding the proposed changes to include phosphorus in the Livestock Manure and Mortalities Management Regulation.